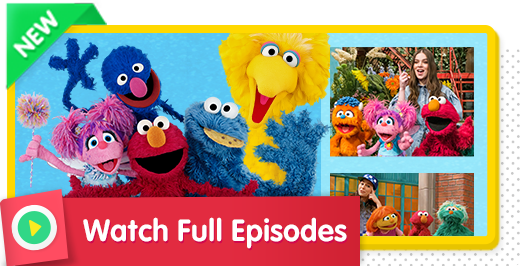 Description: Watch full episodes of Sesame Street here. Description: Sing along with Tori Kelly and learn what it means to be kind! Description: A little girl shares things with her friends. Description: Sing along and see how you can change the world for the better. Description: Sing along with Aloe Blacc and learn what it means to be an everyday hero. Description: Sing along with Sara Bareilles and Abby to see how a bad day can be turned around. Description: Mila Kunis demonstrates the word "include". Description: Abby, Rosita, and Zoe sing about friendship. Description: Come together and sing a song with John Legend and your Sesame Street friends. Description: Sing about how great friends can be with Josh Groban. Description: Sing along with Alessia Cara and learn that you can be different, but similar too. Description: F stands for friend! What does it mean to be a friend? Description: Lupita Nyong'o and Elmo talk about their skin. Description: Sing along and learn how we are all different, but can still be friends. Description: F is for Food. There are all different types of food you can try! Description: S is for shapes. Look around and call out the different shapes around you! Description: Meet Big Bird's pen pal Chamki and say hi! Description: F is for Family. What makes a family? Description: Let's color. There are five crayons! Description: Join Laurie Hernandez and count to five. Five cartwheels! Description: Celebrate Chinese New Year with your friends on Sesame Street. Description: The number six. Turning six and celebrating with six friends is fun! Description: Let's blow bubbles! Count the four bubbles. Description: B is for Birds that fly around! Description: B is for bubbles floating around. Description: H is for the hair on top of your head. Description: 7 haircuts! Let's count it out! Description: Sing along with your Sesame Street friends about how wonderful hair is. Description: Join Elmo for craft time and make a new friend! Description: Y is for yoga, a type of excercise. Description: Sing along with Nick Jonas and learn about different kinds of shapes. Description: Fearless Fred and Franny Jones meet a friendly fiery dragon. Description: Today's letter of the day is "T." Let's name some things that start with "T."
Description: Let's get crafty! C is for craft. Description: Celebrate Thanksgiving with Leon Bridges. Description: She's packing for grandma's and needs 13 things. Let's count them out! Description: F is for frogs that hop all around! Description: Elmo and Abby help Fido find a new home. Description: C is for the clothes you wear! Description: Today's letter of the day is V! What words start with the letter V? Description: V is for Vegetable. Veggies are extra yummy! Description: Four cats playing instruments count to four in Spanish. Description: 10 brave knights lived in a castle and face a scary dragon. Description: W is for Wheels. There are big wheels, small wheels, car wheels, bus wheels. Description: C is for cats, climbing and chasing around! Description: Count it out! There are four wheels. Description: Today's letter of the day is C! What words begin with the letter C? Description: Cookie Monster stops the Crumb's cloud cookie from raining on an artist's sculpture. Description: Today K stands for karate. Do you know karate? Description: Sing along with Ellie Goulding and say thank you to the clouds for the rain drops from above. Description: B is for butterflies flying around! Description: G is for grandparents, they're great! Description: Sing along and celebrate why grandparents are so great! Description: Today's number is two. It's a lot more fun when you dance two by two! Description: Count it out! There are nine amazing people. Description: Will this scientist be able to escape the giant cookiesaurus? Description: Today's letter of the day is A! What words starts with A? Description: Gina Rodriguez and Elmo sing the ABC's en Español. Description: 12 tiny turtle walking and swimming about. Description: B is for bringing a beach ball to the beach. Description: Let's have some summer fun and go surfin' on Sesame Street. Description: Let's make some music. Music starts with M! Description: Today's letter of the day is M. What words begin with the letter M? Description: Sing along to Old MacDonald with you Sesame Street friend. Description: Elmo, Big Bird and Abby sing "Elmo's Got The Moves!" Description: Dance along with Jason Derulo. Description: Dance along with the yip yips! Description: Do the Elmo Slide together. Description: Restaurant starts with the letter "R." Find out what happens when you go to a restaurant. Description: Elmo sings about jumping in puddles. Description: Foods that start with the letter "P."
Description: These heroes work together to save the veggies. Description: Elmo sings about his butterfly friend. Description: Jason Mraz sings a song about being outdoors. Description: There are so many faces you can make on a pumpkin using shapes! Description: H is for Halloween! What are you going to be for Halloween? Description: You can be anything you want to be. All you just need to do is pretend! Description: H is for Holiday! How do you spread holiday cheer? Description: Holiday lights burning so bright, that's how you know it's holiday time! Description: Join your Sesame Street friends and celebrate Halloween! Description: Jingle some bells and sing along to a holiday classic with your Sesame Street friends! Description: Celebrate Valentine's Day with your friends at Sesame Street. Description: Romeo Santos and Elmo sing about making friends. Description: Sing along to spread cheer to let Santa know you're here! Description: Come and play on Sesame Street! Description: Learn the alphabet in outer space. Description: Sing along with Sia and learn about why she loves songs! Description: Meet Danielle the Dinosaur and learn about the letter D! Description: Rosita and friends make music.